The MTS USB Broadband modem employs a ZTE based device driver. 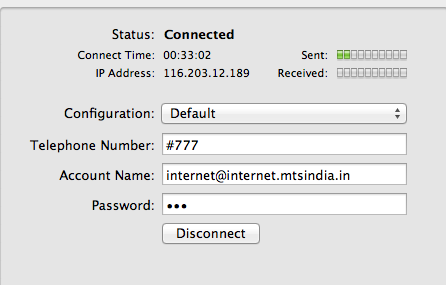 The MTS USB broadband internet modem fails to work out-of-the-box on Mac OS lion 10.7. Many forums suggests that the operating system throws up an error with the screen frozen, asking you to reboot the machine. This is due to the incompatibility of the existing driver that is shipped with the modem. To fix this issue, you may have to install a specific driver viz. ‘CrossPlatformUI-V2.1.2.-SSTL.dmg’. You can download the crossplatformui-v2.1.2-sstl.dmg. Please note to uninstall or remove your previous instance of MTS broadband from your OS. Once downloaded, run the installer and plug your usb modem. Click on connect, and you should be able to access the internet. In this case, double click the MTS application icon on the desktop and try connecting again. Another link to download other ZTE and Huawei drivers for different operating systems. This entry was posted on April 30, 2012 at 12:57 pm	and is filed under Miscellaneous. You can follow any responses to this entry through the RSS 2.0 feed. You can leave a response, or trackback from your own site. Hey, I tried it but it still doesn’t work. Got the same error that you mentioned. I then double clicked the MTS application icon on the desktop and tried connecting again. Still didn’t work. Do you have any idea why? Thanks! Hey I tried what you said but it still doesn’t work. I got the same error that you mentioned. Double clicked the MBlaze icon of the desktop and tried connecting again. Still didn’t work. Any idea why? Hi Thomas, i hope you are connecting the ‘ZTE Wireless Terminal’ from the network. If you tried this method the second time, the system generates a second network ‘ZTE Wireless Terminal 2’ . Try connecting with the second one in that case. Please make sure you double click on the MBlaze icon to initialize the device. 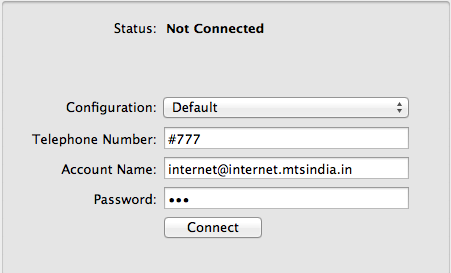 Once you get the error box, click ‘ok’ and try connecting from the network in system preferences.